I normally allow a pupil to hold her arms by her sides, or in front, as she wishes. The key thing is to have her keep her forehead against the wall, so she feels under control. 30 minutes does, indeed, seem a long time in the corner. 10 minutes will often suffice; sometimes 15 minutes; and, for most offences, 20 minutes is usually the most that would be required. 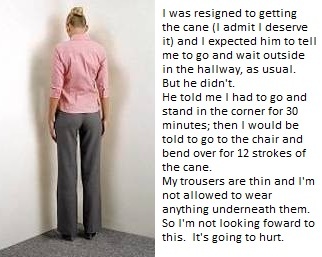 A pupil in the corner does not need to feel that she is being stared at; she should merely feel that she is being checked from time to time, and seen to be meekly in her ignominious position. I agree with the use of corner time as a way to increase anticipation of what is to happen before an application and again afterwards to allow time for the lesson aided by the 'sting' to be fully absorbed. As a general rule I allow candidates to retain their clothing for the initial wait and regardless of if they were bare for punishment, find baring the bottom to show redness and marks helps focus the mind for the period afterwards. The candidate in this position is not under constant surveillance and as it is carried out in a private house, the embarrassment / humiliation is only felt by the individual as a side line to the actual punishment. One other small variation is in that i tend to ask ladies to fold their arms at the back so that the bottom area becomes framed and there is no temptation to touch or fiddle!